Based on the finding, her team is recommending that biopsies should be performed only when medical imaging reveals a thyroid nodule with tiny flecks of calcium, known as microcalcifications, or a nodule that is more than 2 centimeters in diameter and completely solid. Patients with any other findings have too low a cancer risk to require biopsy or continued surveillance, the researchers said . "Compared with other existing guidelines, many of which are complicated to apply, following these simple, evidence-based guidelines would substantially decrease the number of unnecessary thyroid biopsies in the United States," Smith-Bindman said. She noted that the procedures are discomforting, cause worry for patients, and require time off from work and other activities. "Plus, they are often inconclusive. And that can lead us down the path of open surgical biopsy, which is hardly trivial, and quite risky in itself, even in patients without cancer," Smith-Bindman said. Other experts agreed with the need to rein in thyroid biopsies. "Due to the high prevalence of thyroid nodules in the United States population, the increase of incidental detection of these nodules, the demand for higher cost-efficiency, and the avoidance of unnecessary invasive procedures, it is crucial that we begin to limit the number of fine-needle biopsies of these lesions," said Dr. David Hiltzik, director of otolaryngology and head & neck surgery at Staten Island University Hospital in New York City. Hiltzik believes the new study will help doctors "risk stratify each patient and to help decide which patients should and should not be biopsied." "Any cancer diagnosis has a psychological impact," Hiltzik added. "However, in light of the fact that the majority of thyroid cancer has a high survival rate, we must become more judicious in our diagnosis of this disease." 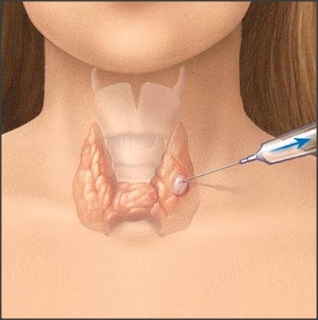 Another expert in thyroid care concurred, and added that there may be better, noninvasive means of determining whether a thyroid growth poses a health risk. "The majority of thyroid nodules, particularly in women, are benign," explained Dr. Eric Genden, chair of otolaryngology at Mount Sinai Medical Center in New York City. "Although current techniques to assess a nodule for malignancy rely on cystology (viewing a sample of cells under a microscope), new techniques using molecular testing have the potential to decrease the risk of unnecessary surgery." About 15,000 men and 45,000 women in the United States will be diagnosed with thyroid cancer this year and 1,850 people will die of it, according to the U.S. National Cancer Institute.